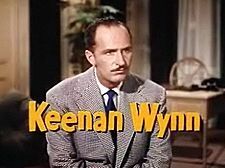 Keenan Wynn (July 27, 1916 – October 14, 1986) was an American character actor. He was born in New York City, New York. He was known for his role in the 1972 thriller movie The Mechanic. Wynn died of pancreatic cancer in Los Angeles, California, aged 70. Keenan Wynn Facts for Kids. Kiddle Encyclopedia.